Indeed, the industry downturn for the past few years - combined with the increasing difficulty to find the new generation of mineral deposits, hidden and deeper - requires immediate attention on meaningful and efficient innovation in the exploration mindset to start reverting the process from the inside-out. Geophysics and geochemistry, outfitted with their exploration vectoring capacities, have been used with great success in pointing towards new deposits. Nevertheless, explorers still need to significantly escalate discoveries within this very apprehensive industry. 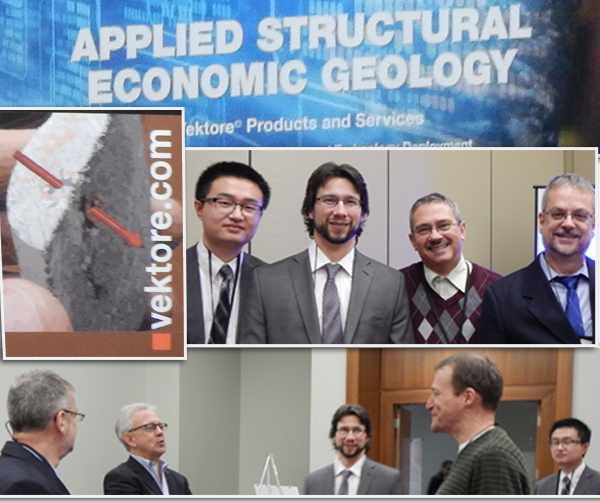 It is Vektore’s opinion that there is much to be gained with the combination of the current geophysical and geochemical exploration practices with that of applied structural geology. We foresee that the combined harmonization of these three fields will take place in the near future as we seek solutions for finding greater numbers and new variations of mineral deposits. It is well recognized that shape and continuity of the mineralization system, as well as its geometry and topology, are critical in unravelling the real potential of a target. For such features to be fully characterized and understood, the incorporation of other tools and methods is required. We believe that Structural Vectoring is the next layer of exploration rationale, which should be further developed and harmonized with the already known vectoring capacities of geophysics and geochemistry. We foresee that the amalgamation of these three fields will take place in the near future, leading to the solutions we seek to significantly increase our exploration capacities. These three players, embedded into a sound geology, should lead not only to much-needed new discoveries, but also to elucidating and expanding existing projects, while reducing expenditures. Geophysical-geochemical-structural vectoring is a robust proposition for an inside-out exploration mindset change. Keep in touch with Vektore for the upcoming posts regarding structural vectoring.